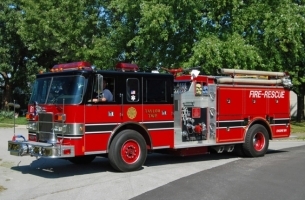 Ambulance 81 responds to all calls for Emergency Medical Services in Taylor Township. It also responds to calls in surrounding areas when requested, including the city of Kokomo when all city ambulances are busy. To staff this piece of equipment and cover it with Emergency Medical Services personnel takes commitment and dedication of the personnel. 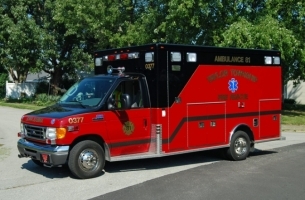 Ambulance 81 is staffed by an Emergency Medical Technician and a Driver Attendant trained by Taylor Township Fire Rescue to assist the EMT with all aspects of an Emergency Response. Ambulance 81 also responds to structure fires and motor vehicle accidents along wtih the fire apparatus to provide rehab and medical attention when a firefighter or occupant are injured. Ambulance 81 averages over 450 EMS calls per year, is fully transport capable and staffed 24 hours 365 day per year. Car 81 responds on all fire related calls where personnel will be operating in an Immediately Dangerous to Life and Health Situation. 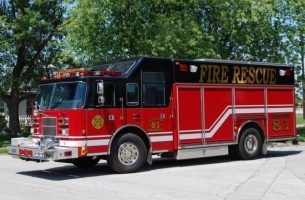 These calls include structure fires, motor vehicle accidents and hazardous materials runs. Car 81 also responds out-of-District with fire apparatus when requested for mutual-aid in surrounding areas. 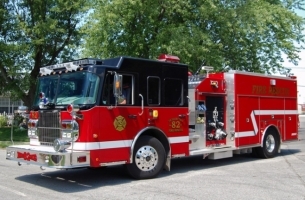 This piece of apparatus is staffed by a Department Officer trained in the Incident Command System. This system is regulated by the Federal Governemnt and basic certification by all members is required. Car 81, when in Command of an incident, coordinates actions on the scene with other operating units, providing a structured method of mitigating the incident while also maintaining accountability of all personnel operating on scene and providing the safest operations as possible when personnel are working in a dangerous environment. Officers are trained to State and Federal requirements plus additional traning provided by the Department. 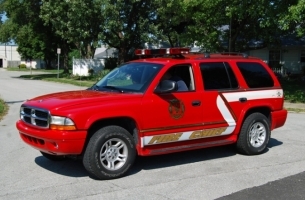 Second Due on Motor Vehicle Accidents, carries full set of Hurst Extrication tools, including the "Jaws of Life"
1998 Pierce Dash with seating for 4 firefighters. Has full compliment of Hurst Extrication tools, three simultaneous pumps, with capability of running 5 tools at once. compressor. First due at Auto Accidents or Rescue incidents. Also carries Rope and water Rescue equipment. Truck Operates as the Rescue or Truck Company at structure fire calls. Brush 81 operates primarily as a response unit for field fires and any fire off road beyond the reach of the fire engines. Brush 81 also responds on investigations of trash or nuisance fires in the Township. By using this smaller truck on these types of calls, it saves the taxpayers money in fuel and maintenance costs on the larger trucks. It also allows the larger apparatus to stay in service in case a structure fire call or other emergency comes in. Brush 81 can also provide first response service in severe weather when roads are snow covered or hazardous. 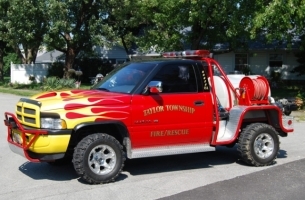 While this truck makes the fewest runs, it is still vital to operations when off-road operations are necessary.